WHAT WAS SCHAUMBURG TOWNSHIP LIKE IN 1952? Starting at the northern, upper part of the map, we can see that Old Higgins Road was in use. This is where the Steinmeyer farm and the Bierman welding and implement dealership were. This area was stilled called Buttermilk Corners at the time. In the middle of the map is Sunderlage School which was also called Meyer School and was officially the District 51 school. It was a one-room schoolhouse and closed in 1954 when the five township school districts were consolidated and students began attending the new four-room Schaumburg School on Schaumburg Road. Further south you’ll notice that, even in 1952, Bode Road had its funny little jogs. Taking Springinsguth down and then making a left on Wise Road, you’ll run into Hartman School. This was the District 55 School and was also referred to as the Straub School. According to LaVonne Presley’s Schaumburg Of My Ancestors, this school “closed its doors in the late 1930s or early 1940s. It fell into disrepair with vandalism and an unkempt school yard”–which would have been very evident in 1952. Directly down Rodenburg Road is the St. John Evangelical Lutheran Church, school and cemetery. At this time all of their buildings were on the east side of Rodenburg. Today they are all on the west side. It is also possible to see Long Avenue and Fenz Road which are still there, although unattached today. Then, at the very southern edge of the township ran the Chicago, Milwaukee, St. Paul and Pacific Railroad which is now the Milwaukee Road West line of the Metra system. We next run into the Roselle Golf Club which opened in 1927 and managed to stay in business through the Depression. Across Roselle Road is the beginnings of the layout for Pleasant Acres, a subdivision designed by Robert Bartlett. Because this was before the library was built, Library Lane was then called Walnut Avenue. Lincoln Street never came to fruition but persistently stayed on future maps for years to come. The one-room Schaumburg Centre School is nestled in on the NW corner of Schaumburg and Roselle. This was the District 54 school or Schween’s School. Fortunately, this school still exists and has been moved to the grounds at St. Peter Lutheran Church and Schools. Their church, school and cemetery are also noted on the map, as is the Christian Day school on the far eastern side of the map. This school was St. Peter’s East District School which opened in 1886 and closed in 1949. You’ll also notice the Evangelical Church to the south, just north of Nerge Road. This church was erected in 1906/1907 as the congregation’s second Zion Evangelical Church. 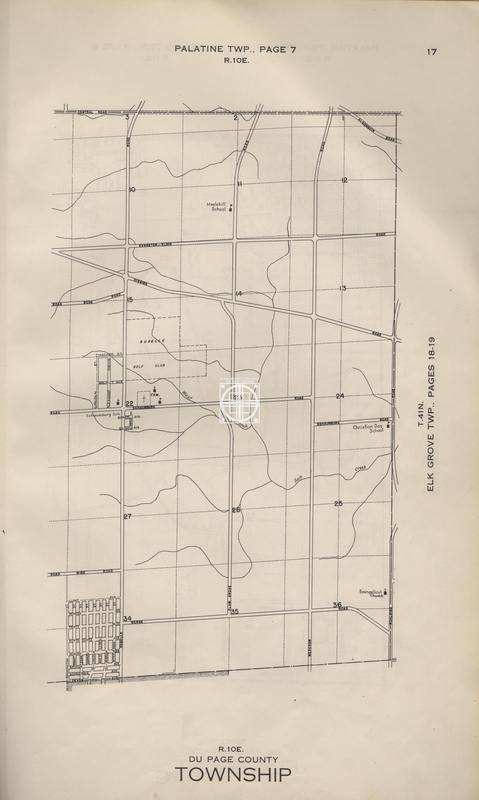 It was later moved to Itasca in 1924 but managed to stay on this map until 1952! Just south of the intersection of Schaumburg and Roselle Roads are Quindel Avenue, Nerge Street and Illinois Avenue. A number of the houses on these streets are, today, significant parts of the Olde Schaumburg Centre District. Moving a bit east you can also see how Plum Grove Road was broken up and took a slight jog at Schaumburg Road. The same thing is evident a bit north at the intersection of Plum Grove and Higgins. It would be interesting to know why Plum Grove wasn’t laid out in a straight line to begin with. Maybe it was because of the farms that lay in its path? The development of Hoffman Estates began in 1954, two years after this map was produced. The farms, small one-room schools and gently flowing streams were about to give way to massive changes that continue to this day. Maybe you were here early enough to recall this bucolic township before the development began? My thanks go out to Linn Beyer, who graciously contributed the atlas that holds this map. It is the Township Maps of Cook County and City of Chicago that was published by the Cook County Highway Department. My thanks also to the Cook County Highway Department for allowing use of the maps on this blog. On January 4 we should have had a birthday party. It was 173 years ago in 1842 that Schaumburg Township was born. Papers were filed in St. Louis with Jos. C. Brown, Surveyor of the public lands for the District of Illinois & Missouri, laying out the 36 sections of our township. At the time the township was known as “Township 41, North of the base line, Range 10 East of the 3° principal Meridian.” The official name, Schaumburg Township, had yet to be adopted. 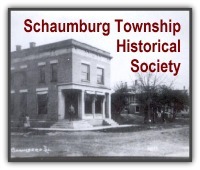 That would happen at the first annual town meeting on April 2, 1850 when Frederick Nerge pounded on the table and insisted that the township be named “Schaumburg” after his homeland in Germany. Thanks to local resident, Linn Beyer, who graciously lent me a variety of old, township maps, you can take a look at the hand drawn townships of Schaumburg, Elk Grove (1842), Hanover (1842), Palatine (1840) and Barrington (1839). The maps are quite a marvel, given their age and the number of physical geography elements that were there in the 1800s that are still evident today. Each township is made up of 36 sections that are one square mile in area. The sections were then divided into quarters. Because it is impossible to make each township perfectly square in the entire state of Illinois due to the curvature of the earth and the uneven boundaries of the state and therefore, the counties, adjustments had to be made to the township lines. In the townships shown here, the adjustments were made on the north and west boundaries of the township, often resulting in smaller sections on those edges. Perfect section lines always began on the south and east sides and expanded to the north and west sides where the adjustments were made. The township system is what the legal description of your property is based on today. The first noticeable thing on the map is Sarah’s Grove, smack dab in the middle of the township–and parts of it certainly exist today. 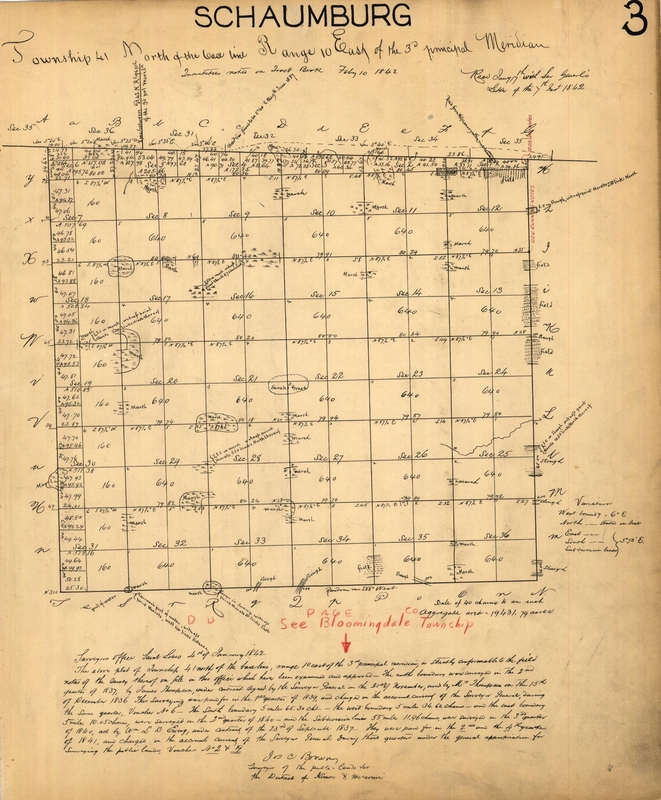 Other than that, the only distinguishing characteristics drawn in by the surveyors were a series of marshes, sloughs, a few fields on the northern, southern and eastern borders and a portion of Salt Creek flowing into Elk Grove Township. Maybe you recognize some of the lower spots today in the township that were marshes and sloughs back then? 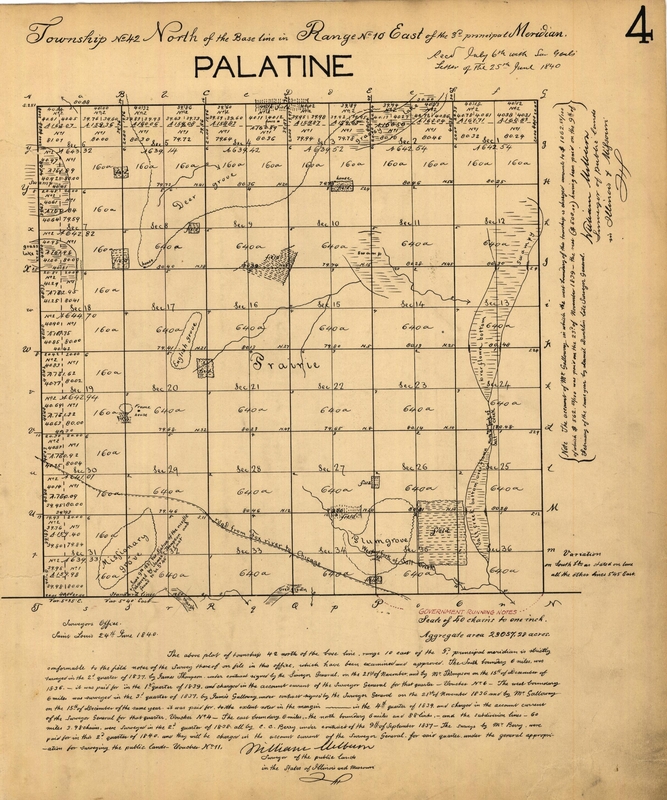 In the upper right corner, you can even note the “Road from Missionary on Fox river to Chicago.” This road came out of Palatine Township and is essentially Algonquin Road today. 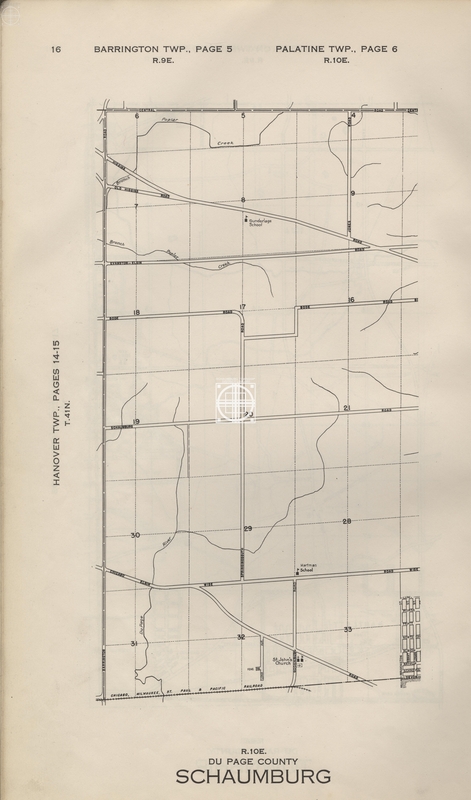 Moving on to Elk Grove Township, one of the most prominent, distinquishing characteristics is the large light bulb-shaped area noted as “Timber.” This would later come to be known as Busse Woods. The next thing your eye goes to are the fields in the shape of a “t.” It’s amazing that this acreage was already planted on such a large scale at such an early time in the history of the county. Salt Creek is also distinct and already named as it runs north to south through the western side of the township. A couple of written notations also mention “witness points” in both the lake at the top of the map and Salt Creek at the bottom. “Witness points” were survey marks set in place by the surveyor to note part of the section lines. It would have been impossible for the surveyor to establish such a point in bodies of water; hence, it was written on the map. Moving west from Schaumburg Township to Hanover Township, fields, sloughs and marshes are very evident. This is the first indication of Poplar Creek which is also already named. It runs east to west through a good portion of the central part of the township. There is even a saw mill near noted hills along the banks of the creek. The sawmill also had a dam on the creek that must have been built to power the mill. Clearly this township was on its way to being settled. The large fields are scattered and one in section 20 even has a house built in the middle. Other houses can be found in Section 8 at the top of the map and Section 34/35 at the bottom. 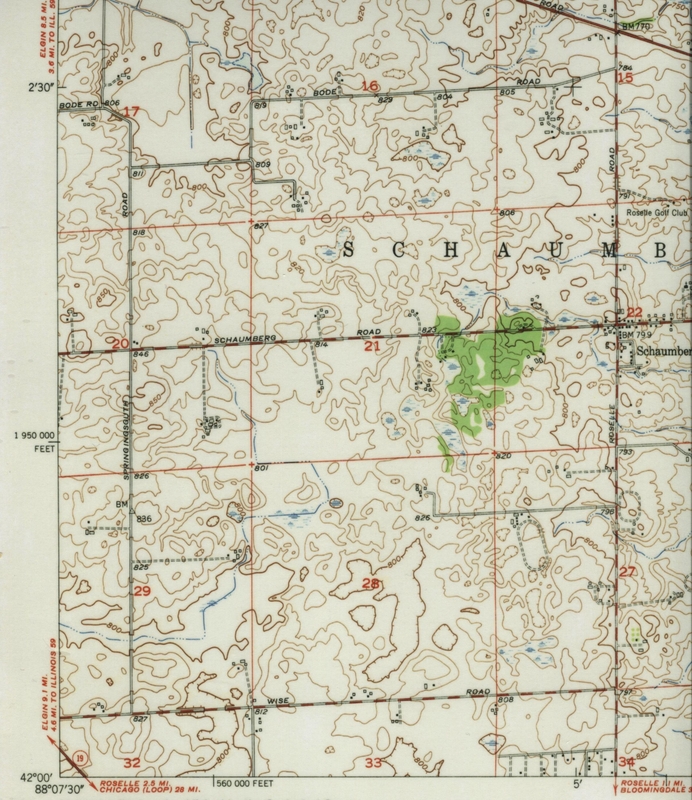 Based on the same type of lines on other maps, the squiggly lines are drawn to make note of a wooded area of the township. As with the future Busse Woods, this area is unnamed unlike similar groves on the next map. Compared to the other maps, Palatine Township is simply littered with groves of trees. Missionary Grove and Plum Grove are in the southern part of the township near its boundary with Schaumburg Township, English Grove is in the center and Deer Grove takes up much of the northern part of the map. Parts of Plum Grove are still in existence today–as well as the similarly named road. Missionary Grove is now the Paul Douglas Forest Preserve. English Grove is part of Inverness and, well, Deer Grove, is still very much a large part of Palatine Township. 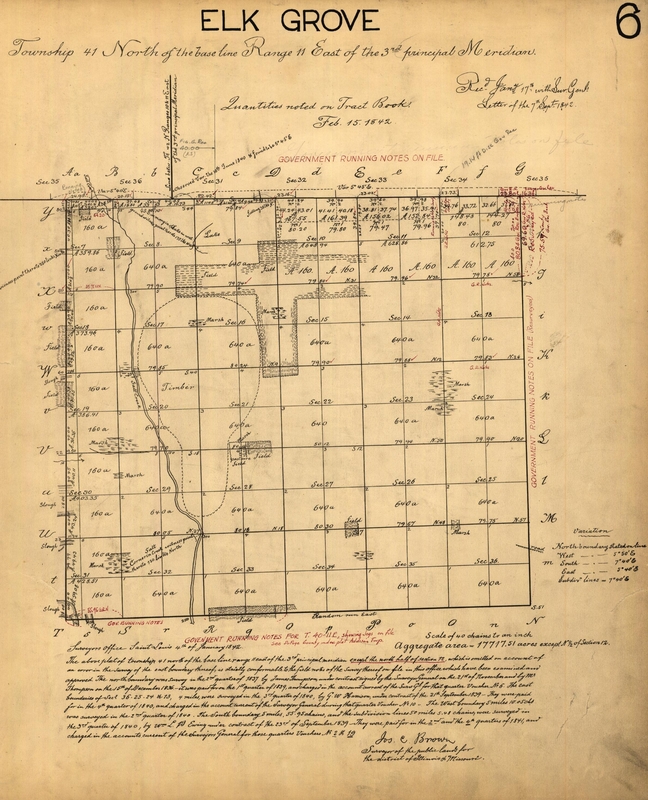 There are a number of fields scattered throughout the township with a couple of houses noted too, including one that is mentioned as a “frame house.” Given that the year was 1840 and it was very much an unsettled area, a frame house must have seemed so unusual that the surveyor felt it was worthy enough to note it on the map. In addition, the “Road from Fox River to Chicago” can also be seen traversing the southern part of the township. This is the early version of Algonquin Road. 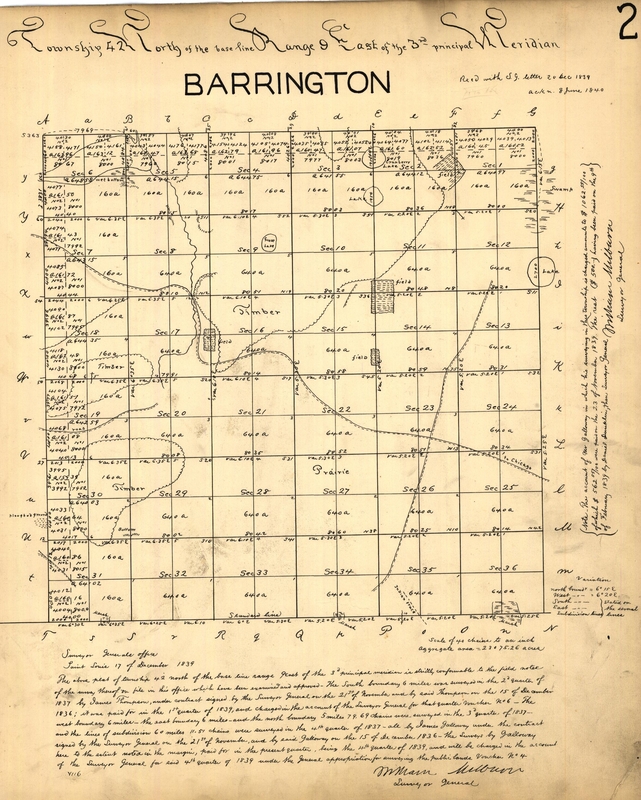 The other distinctive notations on the map are the water patterns in the township. The North Fork of the Salt Creek, along with its “over flown bottom,” drains in a fairly north to south line along the eastern boundary. The West Fork of the Salt Creek flows through Plum Grove and converges with the North Fork in the very southeast corner of the township. In addition to the fairly large swamps in the center and in the northwest corner, there are also two large “grass lakes” shown on both the west and north boundaries. The one on the west boundary with Barrington Township is now known as Baker Lake and is now part of the Baker’s Lake Forest Preserve. The one on the north boundary with Lake County is known today as Deerpath Lake. When we move to Barrington Township, it is clear that what isn’t identified as “Prairie” consists of three substantial “Timber” patches on the west and northern boundaries. All of it is now part of the Spring Creek Valley Forest Preserve and parts of Barrington Hills. Goose Lake is identified in the middle of it and still exists as that name. Two roads move through the township. One comes in from the northwest and traverses through to the southeast border. Again, this is Algonquin Road. The other road moves north to south and crosses Algonquin Road on the eastern side of the map. It looks like it could be the early vestiges of Barrington Road. The interesting thing is there is an “Indian trace” on the southern border. This is another name for a trail. There are also a few fields and marshes but the area appears to be unsettled. After exploring these maps, it’s fairly easy to see why Schaumburg Township remained a quiet enclave for such a long period of time. It was perfect for farming but, due to the lack of waterways or early roads where communities often form, it was destined to be a perfect location for the German farmers who found it in the late 1840s and 1850s. They quickly established St. Peter Lutheran Church in 1847 and created a tight community within the boundaries of the township. 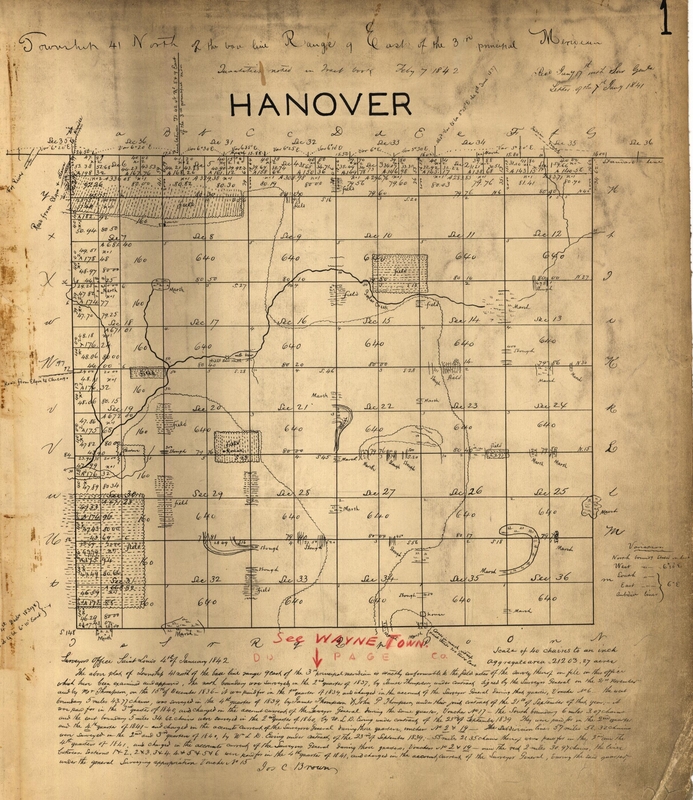 It wasn’t until after World War II that the township moved from rural to suburban but, even so, many of the identifiable spots on these old maps remain to this day. It’s hard to fool with Mother Nature! I recently came across this 1953 topographical map of the Palatine quadrangle. In looking over it, I noticed the blue stream running through the portion of the map shown above. This is the West Branch of the Du Page River and it doesn’t start in Campanelli Park as I mentioned here. If you follow it, you’ll notice that it once started just south and east of the intersection of Schaumburg and Springinsguth Roads. With the development of the Weathersfield subdivision, the land–and the stream–were graded at some point, moving the starting point of the river further south. At the time of this map’s publication, the land where the stream originated was part of the Ode D. Jenning’s farm. Mr. Jennings died in 1953 and the property then passed into his wife’s hands. You can see their long lane ending at a group of buildings. Three of the buildings on this property still stand. You know them as the Schaumburg Barn, the offices of the Schaumburg Athletic Association and the Jennings home which serves as a location for a non-profit organization. For more information, read about Mr. Jennings here and his farm here. You’ll also notice in this map that you can actually see some of the ridge of the continental divide. It is the portion that is outlined in a darker brown next to the number 28. In reading a topographical map, these darker portions indicate a higher elevation of the land. There is another such site almost due south. This is the path of the continental divide that creates the drainage pattern for the township. The green blob that straddles Schaumburg Road is Sarah’s Grove, pre-development. This area later covered Timbercrest, The Woods (both appropriately named) and Friendship Village. The long lane that runs south of the grove started at Roselle Road and ended at the Engelking farm. It was the origination of today’s Weathersfield Way. The racing oval to the south was part of the Daisy Mayer farm at the time. According to an oral history done with Ralph Engelking, this oval was built in the Depression as a training track for trotters. The farm was called May Day Stock Farm. You can see another oval almost due east across Roselle Road. This farm belonged to Virginia Mansfield who was known locally for the horses she raised. These were two of five racing ovals in Schaumburg Township. Topographical maps give a wealth of data from elevation to swampy areas to schools to cemeteries. We have a number of them in the library’s Illinois Collection map file that cover Schaumburg Township. Feel free to stop by anytime and take a look. Or maybe you see something else that catches your eye on this map? Leave a comment and let us know!